Professor Challenger summons friends to come to his house, each one to bring a cylinder of pure oxygen. Challenger is convinced that the earth is entering a poison belt of ether and that life is doomed. In a sealed room, to the slow hiss of escaping oxygen, he and his friends wait as humanity prepares to meet its fate. The Poison Belt is a doomsday story as the world moves through a mysterious "belt" of gasses that cause people to lose control. The four characters who make up the adventurous team attempting to stave off Earth's extinction, however, have little to recommend them--a bellicose egomaniac genius, a competitive lesser light who whines, a journalist, and an aristocrat who primarily hunts. The story is filled with long discourses on scientific and philosophical topics, so much so that I found myself fast-forwarding to see if anything happened. By the time this reader reached the end of the book, she didn't care whether the Earth was saved or not. This presentation is very dry. You might like the story better if you read it. 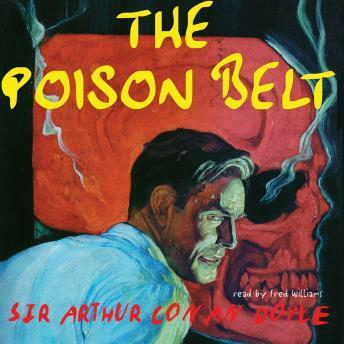 This is one of the worst books I have ever listened to and I am a fan of Sir Arthur Conan Doyle. The reader is so dry and humerless. I'm surprised that this was allowed to be produced with this reader. If you want something to put you to sleep quickly than rent this book. Ughhh... If I could give this a negative rating it would be a minus 10.